On Friday, October 2, Dr. Fayneese Miller was officially installed as the university’s 20th president. Dignitaries from across the nation, along with faculty, staff, students, and alumni joined Hamline University in celebrating this historic event at Minnesota’s first university. She is the first African American president in the history of Hamline and the university’s second woman president. 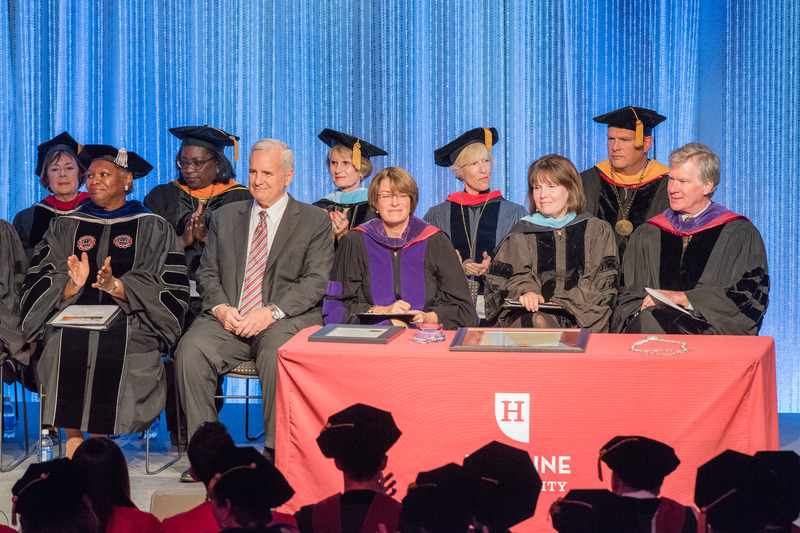 The ceremony included remarks from Governor of Minnesota Mark Dayton, Senator Amy Klobuchar, Congresswoman Betty McCollum, Saint Paul Mayor Chris Coleman, distinguished and nationally acclaimed academic leaders, and remarks from Hamline’s new president, Dr. Fayneese Miller. "We prepare leaders for tomorrow by opening up the world of ideas to our students and providing opportunities to learn what is possible and how to act on those possibilities," Miller said in her Installation Ceremony remarks. "We encourage, through our teaching, writing, and high impact practices, that each of us matters. We provide a space for social cohesion—a place to discuss ideas, to form key civic relationships, to learn to lead. We value intellectual curiosity, social justice, civic engagement, inclusion, and participation. In essence, we prepare future leaders who embrace social excellence." View President Miller’s full speech here. Dr. Miller brings more than 30 years of academic and higher education leadership experience to her roles as president of Hamline and as a member of the faculty as a professor of psychology and professor of education. Before coming to Hamline, she served as dean of the College of Education and Social Services and professor of leadership and developmental sciences at the University of Vermont. View our About the President page to learn more about her background and experience.